Method: Choose a subject which has a substantial number of detailed parts. Think about whether these parts will be repeated (a plate of baked beans, for example) or all different (a hyper-realist drawing of pins and nails). Consider also whether the parts will be drawn from observation or invented (as in the work of Paul Noble). Remember that the original subject may not be primarily visual (in extended doodling, for example); you may be using drawing to describe a narrative or even musical score, so that the imagery is secondary to the relationships between the elements. After all the research into the artists for this section the work I was most drawn to was that of Stephen Walter, Harsha and Richard Wright. 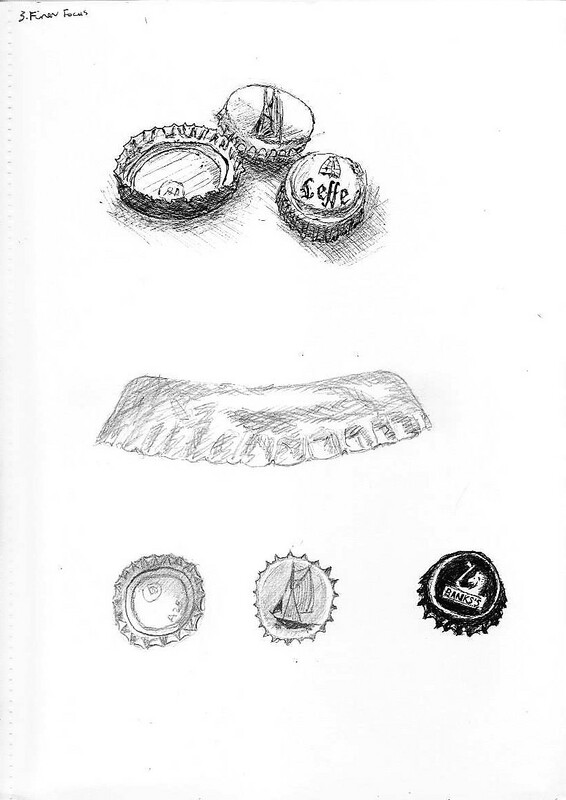 Using the repeating pattern of a similar shaped bottle top but with a variety of names and emblems the first of these works the “Bottle Tops & Newspaper”. This combines the repeating shape of similar bottle tops against a background of a newspaper. The variety of colours and the haphazard arrangement of the bottle-tops on top of the diagonally placed newspaper and all united by being set against the newspaper. This common element unites these disparate elements and colours. 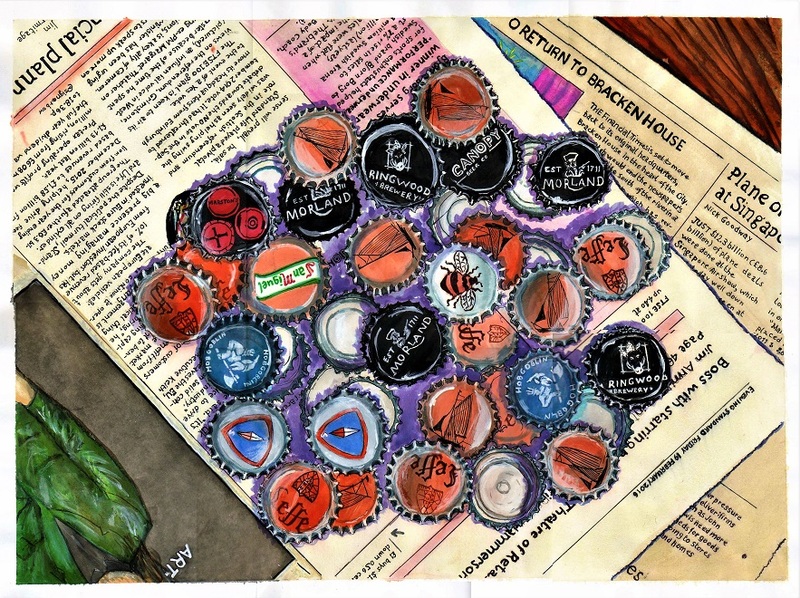 On closer examination, what initially seems an irregularly shaped mass in the centre of the newspaper resolves into a multitude of individual bottle tops from a variety of beers and breweries. The second of the works in this exercise is heavily influenced by the work of Stephen Walter. He uses maps along with his own individual commentary to describe and inform about the area he depicts. In my work “Alba”, I use a trip I made a few months with my wife and dog around the north of the UK, especially the Highlands of Scotland. In this work I have noted comments on where we visited, along with small drawings which are repeats of some of those in my ‘parallel project’ to illustrate our journey and what we saw. This journey of a few weeks allowed us the time to meet locals and here their tales of local legion and myths, of which I have made notes and drawings to remember them. each level in a place. When looking at artists books and researching works with detail I reviewed work by medieval monks, ‘illuminated manuscripts’. These works had intricately drawn and coloured initial and capital letters. I have used some of these ‘illuminated capitals’ to provide a detailed and colourful title to the work. Reflect on how this affects your relationship with the subject and the process and what it communicates to the viewer. 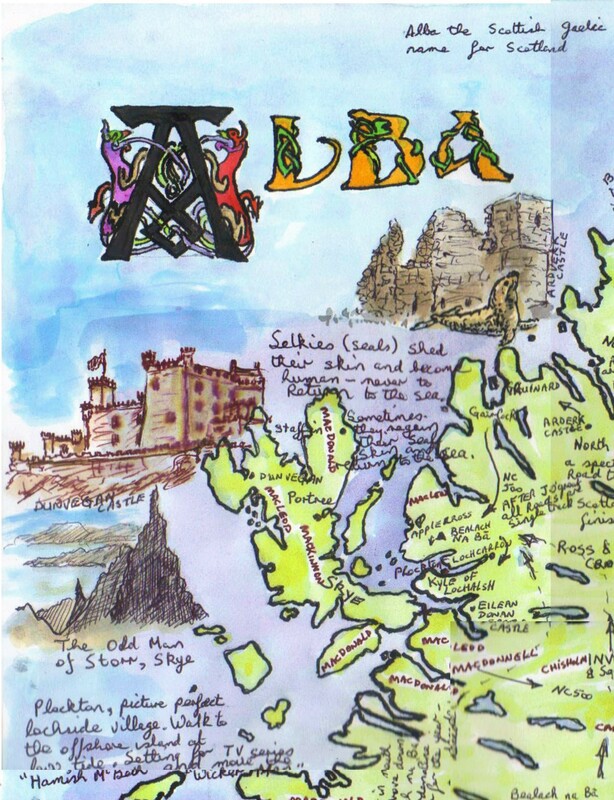 In the map of Alba I have recounted and retold personal stories of my own experience and those told to me. 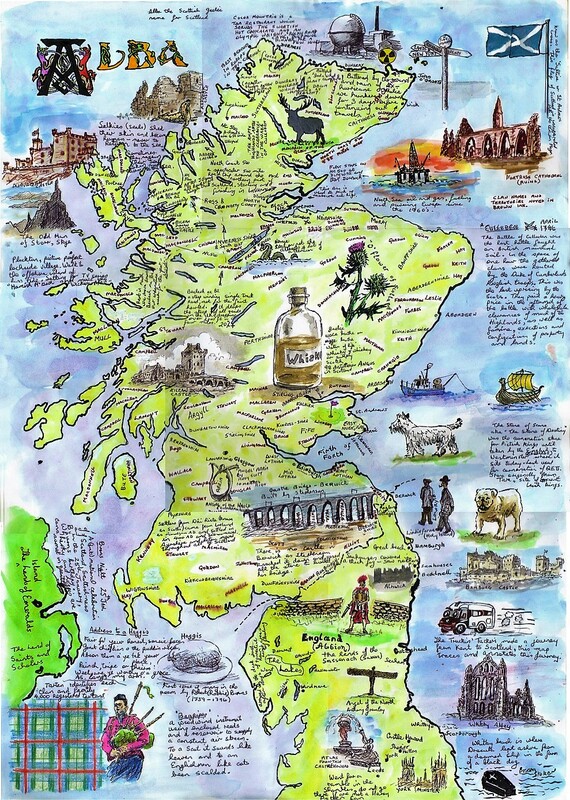 This map as a whole is reminder of the time and places we visited on our journey through the north of England and into Scotland and especially into the Highlands. Those the relationship between me and this work is very close and personal as it is the visual representation of a five-week trip. It is a reminder of the storms, the sun, wind and rain, beach walks and meals along with the places and people we meet. When doing the work, I was quite involved in the re-telling of our trip that I didn’t realise until complete that it took several days to complete even once the prep work was complete. Once I finished this piece I was much inspired to do one for all future trips I might make with my wife, dog and campervan. This very personal and individual to me work is like the cumulation of dozens of photos and diaries from our trip. The viewer once he starts to look past the initial map of the northern half of the UK will slowly realise that this is a very personal and individual work retelling the unique experiences of the maker. 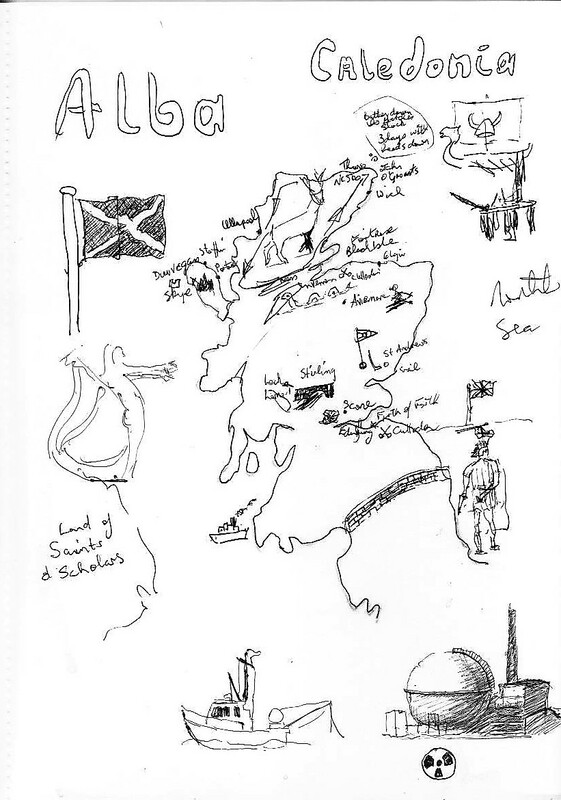 In addition to the detail of our trip the viewer will recount old tales and legend as well as seeing the family names associated with areas and how these intertwine across features recounting in this the local and wider history of Scotland. Works such as “Alba” and “Bottle-tops and Newspaper” allow the viewer to see a picture that work on two levels. One, the picture communicates the initial visual story of it, i.e. a pile of beer bottle-tops on a newspaper. Secondly, then they will start to see the detail within the work. Which different breweries are represented, what beers, and what the newspaper stories and snatches of information half seen are about. This steady flow of information only encourages and entices the viewer to continue to read the work and learn all what the artist intended. Through much of the history of Western Art there has been a visual language in play that viewers knew. When looking at a painting they used the visual hints and clues left by the painter. An example of this is “The Ambassadors” by Holbein (1533), in this work he paints various clues as to the identity of the figures depicted [the globe centred on the home town of one of the figures], the politics of the times [i.e. the lute with broken string noting the disharmony and religious strife of the time, these were emissaries from the pope to Henry VIII]. The books, instruments hinted at the living world whilst the anamorphic skull at death. When, detail is used in a work the artist can use it to communicate ideas and meaning on several levels. The obvious and intended meaning which is seen at first glance; then the detail within the work slowly reveals the additional information that the artist intends the non-casual viewer to see. This further reading of the work will impart a host of detail through text, objects, context and positioning. A work may contain obvious or hidden meaning but if an artist includes a host of detail in his work this has the potential as a minimum to entice and involve the viewer into seeking more information within the work. Involving the viewer in reading the work may sub-consciously lead him to like it more! Grovier, K. (2018). Seven surprising hidden meanings in art. [online] Bbc.com. Available at: http://www.bbc.com/culture/story/20161020-seven-surprising-hidden-meanings-in-art [Accessed 19 May 2018].